The faculty of Mass Communication organized a field trip to a number of leading media organizations in Cairo on 11-13 December 2018. About 40 students participated in this trip. The coordination of the trip was managed under the supervision of Dr. Hani El Khateeb, Dr. Hamdy Ahmed, Dr. Noha Alasdoudy and Mr. Essam Hamad. The trip program began with a visit to the Middle East News Agency (MENA) in downtown Cairo where the PUA media delegation was received by Ms. Hala Murad, the Director of the Training Centre who gave a presentation on the training and tuitional courses offered by MENA in journalistic writing, photography, editing and TV montage. At the end of her introductory words, Ms. Hala Murad apprised the students of how to make a good use of the activities of the MENA Training Centre. Then, Mr. Ayman Mohamed, an editor in the Video Department and Mr. Ramy, a member of the PR staff escorted the students in a tour around the MENA different departments. The group then headed for Al Ahram Newspaper where they firstly received by Mr. Osama Omar, a member of the PR staff, to be introduced later to Mr. Abdelmajeed, the Head of the Public Relations Department who escorted them in a tour around this large organization. During this tour, he oriented them towards the history of Al Ahram Newspaper, its development all over the past years and the most prominent figures who paid a visit to this organization. They were also given a brief synopsis of the former editors in chief of Al Ahram Newspaper, the most renowned of whom was Mr. Mohamed Hassanein Heikal. The group also visited the newspaper’s Editing Room, the Central Editing Desk to be acquainted with the processes of journalistic writing and the designing of the pages layout. The group then went, along with the Head of the PR Department in an inspection tour to Al Ahram Presses where they were given a detailed explanation of the process of separating colors, papers and inks during the printing process and the computer uses in all the printing phases of the newspaper especially after the huge technological leap that Al Ahram organization has witnessed lately. This was an impact of the cut-throat competition Al Ahram entered with the other means of media. Afterwards, the group went on a Nile cruise to have dinner, and then they returned to the hostel they stayed in. At the following day, the group visited the faculty of Mass Communication- Cairo University where they were received by Prof. Heba El Samery, the faculty dean and Prof. Waleed Fathallah, the vice dean. 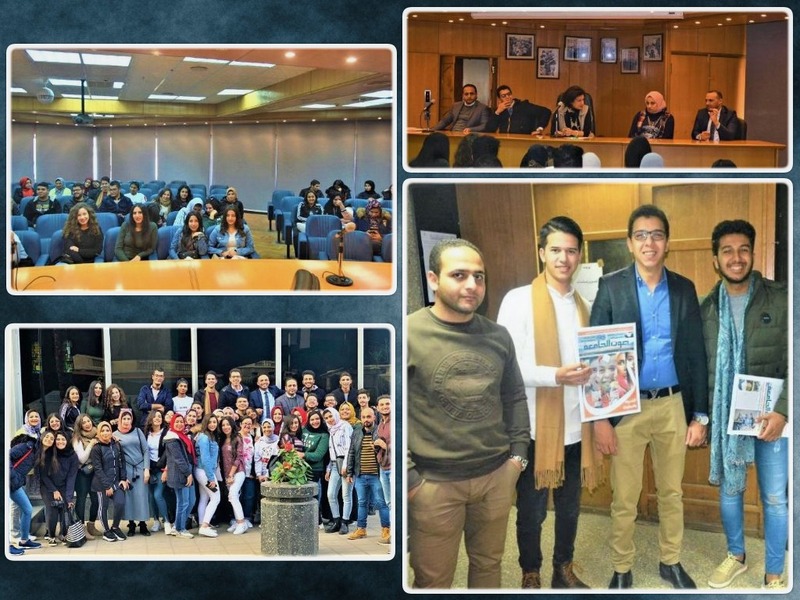 Then, the group was escorted to the faculty press where they witnessed the printing of the faculty’s magazine entitled “The Voice of Cairo University” and were apprised of how the colors are printed and separated as well as the editing and printing processes adopted on publishing books. 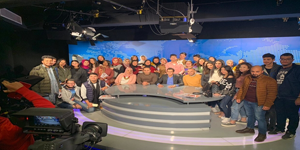 By the end of the visit, the group went to the faculty’s library, TV and Radio studios and the highly advanced studio which was given by Sky News Arabia to the faculty of Mass Communication.